If you're a police officer, paramedic or firefighter, you never know what the day will bring. That's particularly true for members of the Superior Fire Department. 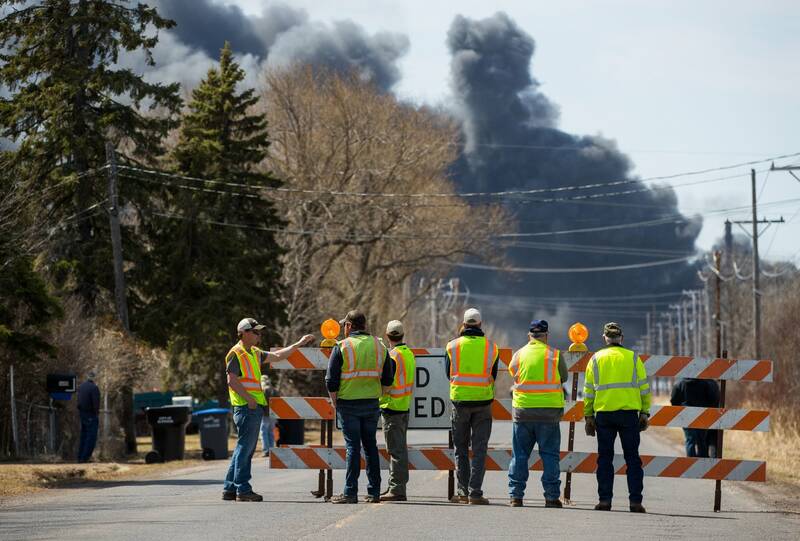 Mike Hoyt and Dan Sertich were among the more than 50 firefighters who initially responded Thursday morning to an explosion at the Husky Energy refinery in the northwestern Wisconsin community. 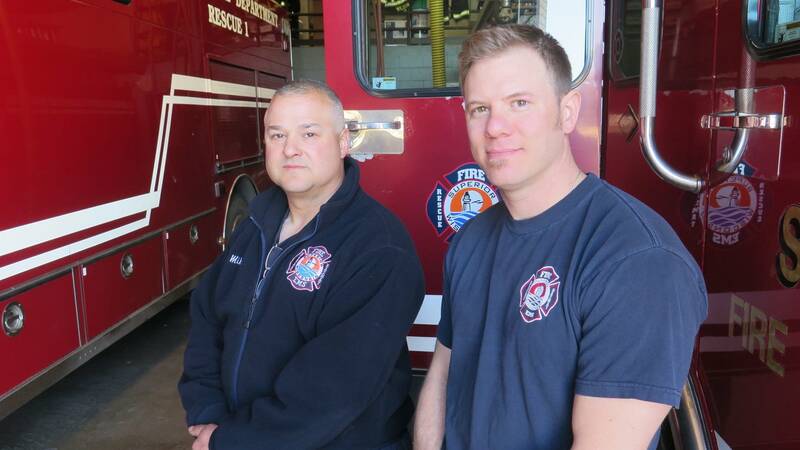 They enjoyed a relatively quiet weekend back at the firehouse, where they recounted what it was like to respond to the large, complex and particularly dangerous fire scene. Hoyt said that they'd worked the overnight shift and had gone home for the day Thursday morning after rescuing a deer that had fallen through the ice at Billings Park. "I was at home at the time when I heard and felt the explosion at my house 13 miles south of the city and immediately started to come into town. When we got there, there was no visible smoke from any place except the flareoff tower," Hoyt said. The explosion happened at about 10 a.m. Hoyt said he arrived on the scene about 15 minutes after the first Superior Fire Department crew. By then, Husky Energy's on-site emergency response team was already getting everyone out of the refinery. Hoyt says that in itself was a big task; a major maintenance project was underway, and about 500 people were working at the plant that morning, including many contractors. "They did a marvelous job of accounting for everybody in that refinery, including those people who'd already gone to the hospital," he said. "There were some small spot fires that they had taken care of after the initial explosion and it was well under control at that point." 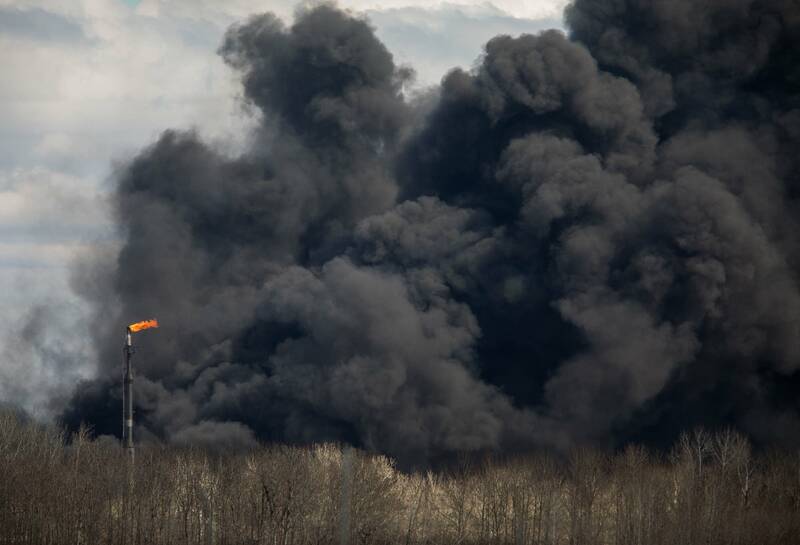 But then at noon, an asphalt tank that had ruptured in the blast caught on fire, sending thick, black smoke billowing into the air over Superior and blowing south. Hoyt says it was nearly impossible to stop the viscous liquid from flowing. The asphalt is stored hot, at around 350 degrees. His colleague, firefighter Dan Sertich, said controlling heat and fuel is a major challenge at a refinery, where both are abundant. Sertich said there is a wide variety of flammable materials on site — all of which could ignite without warning. Once the asphalt caught fire, he said, it was difficult to manage. "It started rather quickly and spread. When you get a large amount of heat like that, we had wind," he said. "All the elements were there to really get that going. And for us, you don't know what's burning." Sertich said a deluge system installed at the plant continually dumped water on an area where hydrogen fluoride is stored to keep it cool. A leak of the highly toxic chemical could have been devastating for the area. Public officials and many residents feared the fire might burn for days. But the crew of around 50 Husky Energy and Superior firefighters got it under control by 7 p.m. Thursday. Departments from out of town, including the Twin Cities, provided assistance. Sertich credited good leadership — as well as regular training between his department and Husky Energy staff — for preventing the situation from going from bad to worse. "There were really good decisions made early on. And you just keep reassessing. You keep trying to push, and you stick to your mission," he said. In 16 years with the Superior Fire Department, Hoyt said he's never been involved in such a serious incident. He said he hopes it's a once-in-a-lifetime event. But at the same time, he said it brought out the best in his neighbors. "When I went home I looked at Facebook, which I normally don't do. But it impressed me that citizens of Duluth were offering up their houses as places of refuge for citizens of Superior who'd been evacuated," Hoyt said. "And it just goes to show what type of community we live in up here in the Duluth-Superior area." Twenty people were injured during the incident. No one was killed. Investigators from several federal agencies are still trying to determine what set off the explosion.